Today Helena and I became a certified Real Boat Owners. How did this happen, you ask? Did we cross an ocean? Take a three-star sextant sight? Survive a gale at sea? What made us Real Boat Owners was much more difficult than that — a challenge dreaded and avoided by those who haven't yet made the grade, as if it were the plague. I must admit that I had avoided this test of courage myself for more years than I wish to admit. But sometimes you just have to do what you have to do, so today we grit our teeth, girded our loins, held our noses, and rebuilt Petronella's marine toilet. And actually, it wasn't as bad as I expected! The pump had been leaking a bit around the piston rod since the Caribbean, but coming up from Beaufort we'd been getting some back flow from the holding tank (see, this is difficult even to READ! Imagine doing it! ), so I knew we had to fix something, pronto. I did some reading on the Internet, ordered a couple of service kits and had them delivered to the marina we were headed for, and commenced dreading the job. 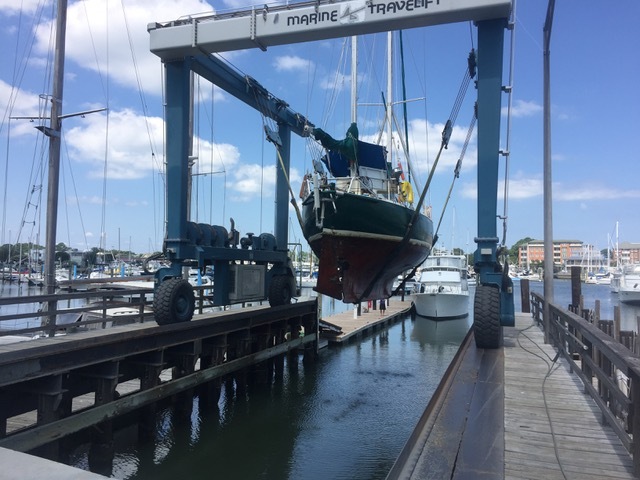 Once we arrived in Norfolk, and were able to use the marina facilities, Helena, had the foresight to start flushing clean water, soap, and bleach through the system several times a day. So by the time we disassembled the pump, etc., this morning, the system was as clean inside as a whistle, except for the scale (mineral deposits) that had built up on the various parts. So if you have been avoiding becoming a certified Real Boat Owner, I'm here to tell you, it's not so bad. We are still in Norfolk, catching up on repairs, hauling the boat out so Howdy could poke at the bottom, and otherwise keeping busy. We will be heading north as soon as we can — possibly tomorrow morning. Hoping for fair winds, or at least light winds. We have the mouth of the Chesapeake to cross next and want to pick a good weather window. Sounds like you enjoy plumbing as much as I do! 2. Payday is Friday. Hang in there!"